FREE DELIVERY - You can track your delivery by clicking on “My Account” and selecting “Tracking” on the right hand side under “Orders”. It's simple really! We deliver products to our customers anywhere Worldwide. We offer FREE DELIVERY on all orders to the UK, Europe, USA and Singapore with a value of greater than £79. *FREE SHIPPING promotions have minimum order value qualifications - check your cart for notification of illegibility. We deliver within 3-5 working days of receiving your order* using Hermes / Royal Mail / GLS / Parcel Force, FEDEX, UPS or DHL Tracked/International Signed for Service. *Some products have a Lead Time in days. This Lead Time relates to the time taken for items to be processed at the factory/distribution centre. This time should be added to our 3-5 day period for items to arrive. 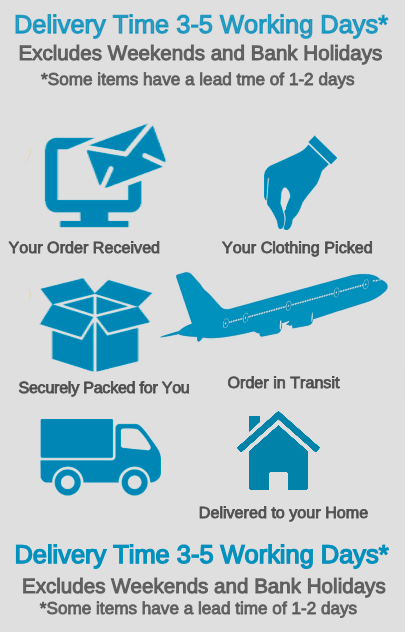 All packages are tracked on the internet and updates on package progress are sent via email or text message to you. We cannot deliver to any PO BOX addresses. You will need to sign for the goods and provide proof of your identity. For large orders - greater than 20 items you can use the contact form to discuss your requirements.